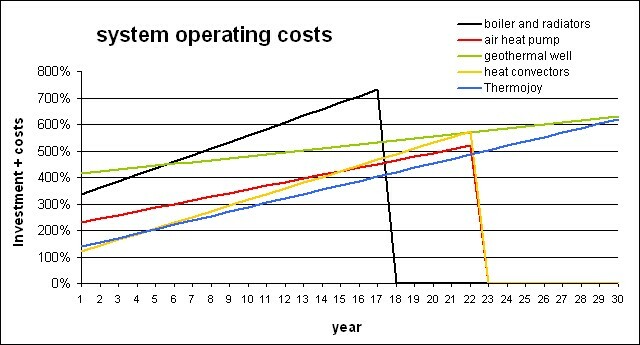 Point 1 on the X-axis of the chart shows the purchase costs of the various types of heating systems in comparison to Thermojoy infrared heating. The slopes of the coloured lines represent the annual operating costs for each system (energy used and maintenance). 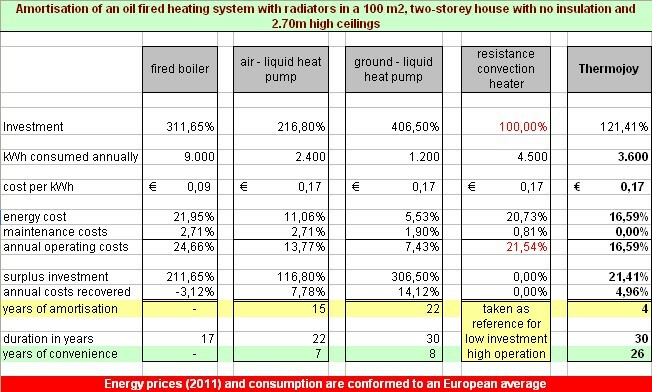 The table shows the purchase, energy and maintenance costs of the various heating solutions in comparison to Thermojoy energy saving heating. The amortisation is calculated as the ratio between the excess investment and the annual expenses to be recovered. The excess investment is calculated as the difference between Thermojoy electricity saving heater and one that costs less. The annual recovered expenses are calculated as the difference in operating costs compared to one with higher costs. The years of cost benefits are calculated as the difference between the years of life and the years of amortisation.